I want to tread lightly on earth today in my own wishful way to counter violence in the world. Now, I don’t want to give you the impression I’m a veggie loving tree hugger here. I am an ex-soldier, I understand war in ways. I understand our kind of war at least, the kind that leads to stopping violent people from destroying and killing innocent people. This morning I opened the paper to the headline, “Militants put juice bars on front line” by Los Angeles Times reporter Mark Magnier. In Lahore Pakistan, juice bars are considered places of sin by Militant Islam because men and women are allowed to speak with each other there. These juice bars provide a place for young people to go, to talk, to relax. Well they would have anyway, except they have been bombed on many occasions. In the past Lahore was a more tolerant city, until Islamic fundamentalist started to settle in. Now there is no longer peace or safety. I know the Western Countries can’t fight every battle, and this is another issue of unrest out of a great many. However, this is one that captures my thoughts. Perhaps because it’s about freedom and food, two things very important to me. So, I went into my kitchen and made this breakfast milk, hoping it hurt few in the food chain and taking nothing for granted. Maybe just for today I can be a tree hugging hippie. 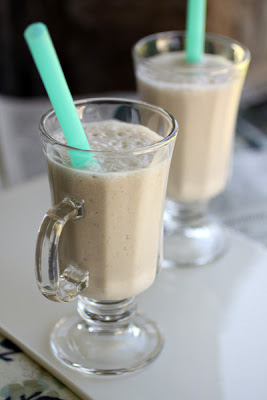 Blend together in a blender on high speed for about a minute, or until blended and frothy. Serve immediately. Sounds like the perfect drink- you hippy you! I'm a tree-hugging hippie, so... These sound amazing!! Great I'll join you girlichef lol! This will be a great drink to make in my new blender. Sounds yummy. Check out my bog... I did a variation of your shortbread. I'll bet you enjoyed every sip. It's a tough world, Laura. Not every battle can be fought. Permission granted to hug a tree :-). Sounds lovely. Nice tropical flavor. Thanks for sharing a bit of you. Hi Laura, this shake looks really yummy, it will just perfect for this saturday BBQ, mmy baby loves bananas a lot. I love this post, you really touch me. thanks for sharing your shakes! Join our growing food cummunity and share your comments. Perhaps instead of hugging a tree today I'll make this. Sounds less embarrassing. Lol! I don't know, I'd love to see you hug a tree. Thank-you for visiting and the comments everyone. I would really like this - great recipe ! You don't have to be a tree hugging hippie to open your eyes to what's happening in our world. I felt like that watching/reading about the Iranian election. We can't begin to imagine how fortunate we are to live freely, when so many people do not. Fantastic smoothie! I love anything with coconut! See, I had never thought of putting coconut in my smoothies, what a great idea you have given me Laura!